One of Zoe and my favorite things to do on a weekend morning is to get up early and head out on a nature adventure. Recently we have been heading for a local hiking trail. And this past fourth of July weekend we got up extra early to beat any crowds. While most people were nursing their hang overs and barely crawling to breakfast, we were overlooking a fogged in Santa Barbara with endorphins pumping and surrounded by nature. By 9:15 we had completed a two hour hike and were already back home with the whole day ahead of us open for possibilities. Zoe is totally my nature girl, she will choose a stick over a squeaky toy any day. And when it comes to exploring trails she is a pro. Whether it means keeping us safe from the clear and present danger of squirrels, or running ahead and adventuring down the ravine to investigate a noise, she is on it! Being on the trail for her means freedom in the great outdoors, while of course always looking back to make sure I am close by. To me getting on the trail means an opportunity to unplug, with a clear reminder that my Facebook updates, tweets, and any stressful business endeavors are irrelevant to the power of mother nature. When we are on the trail it is just Zoe and me, exploring and adventuring with the land. 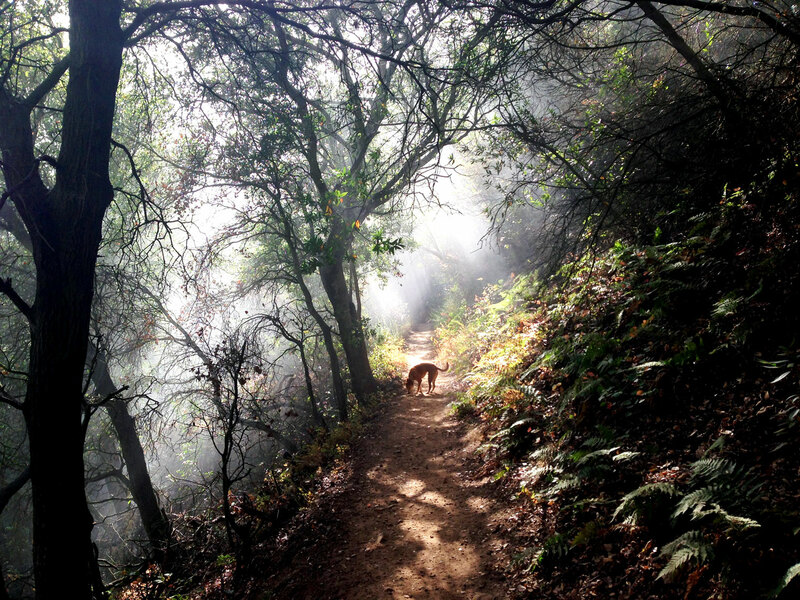 On our way down from our recent hike I snapped the photo above because as I turned one of the switchbacks this very view took my breath away and encapsulated everything I was feeling so grateful for at the moment… the light shinning through the trees, my beautiful and healthy and adventurous dog, and the sheer ability to be in this space and time… in our own private magical forest. As we got back to the car the there were numerous people starting out on the trail, I smiled at Zoe as she looked up at me appreciative for our early rising. Together we got in the car and headed back home, taking with us our adventure and holding on to our magical forest memory. Remember, when in doubt, get on the trail.